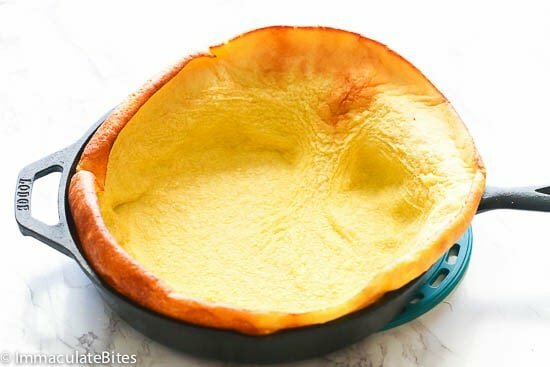 German Pancakes – baked pancakes that are lighter than your usual pancakes made primarily with eggs, milk, flour and vanilla. These pancakes are baked in a pan which makes a quick and easy breakfast pancake or breakfast-for-dinner in no time. We love love pancakes! It’s a staple here at home since my son simply adores them. He even tried preparing some all by himself and it just made this Mama here so proud of my little chef! And since he love pancake so much, we tend to get a little bit creative with it every now and then like adding some chocolate chips into the batter or making this Banana Pancakes recipe. Moreover, since Valentine’s Day is few days away, well…. what could be better than waking up to an indulgent and super easy breakfast in bed? This one here obviously isn’t your typical morning pancakes and it’s waaaay easier. What is a German Pancake? Are German Pancakes Really German? German pancakes are super simple to make. In fact, they’re the most fuss-free breakfast you would know. 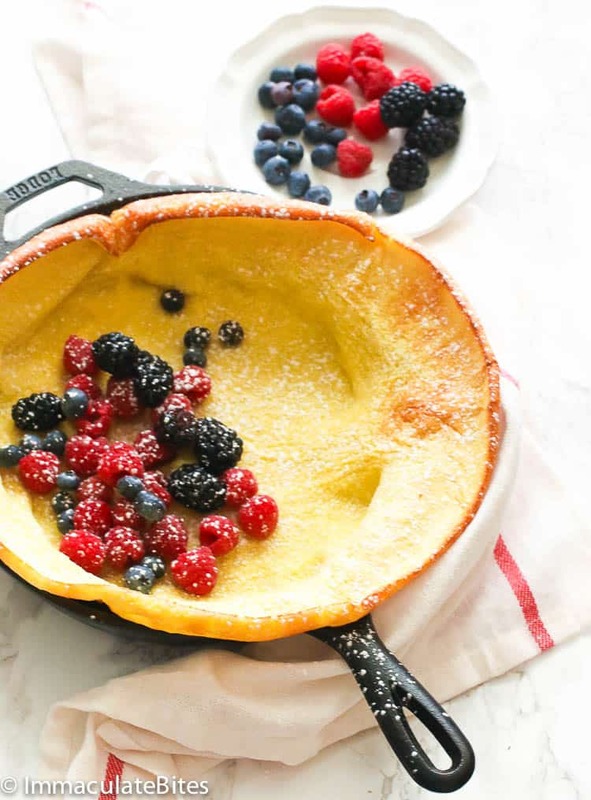 Also known as fluffy pancakes or Dutch baby pancakes, German pancakes are typically made with eggs, milk, flour, sugar and vanilla, HOWEVER, there’s no flipping involved. These pancakes are baked in one go with a metal or cast iron pan, puff ups and then fall as it cools. This large American popover is said to have originated in the Atlantic side. 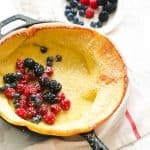 It’s other alias, Dutch baby, was invented in Seattle, Washington with the Dutch name having to do with the Pennsylvania Dutch (referring to German settlers as Deutsch or Deitsch) – a group formed by German immigrants in the 17th and 18th century. How to Make German Pancakes on the Stove? For those who want that stovetop pancake taste, you can still prepare this German pancake over the stovetop. 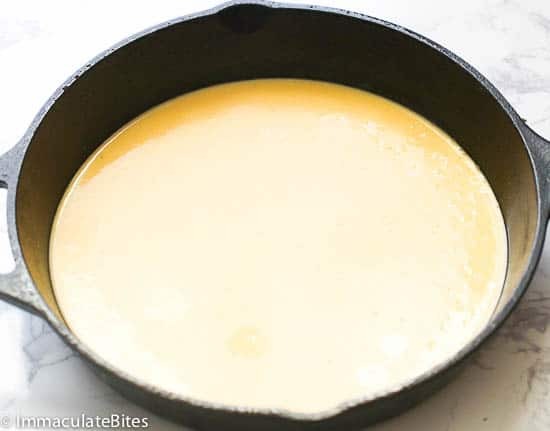 Simply melt the butter in a skillet or pan, gently pour batter and move pan in a circular motion to get the batter to spread and form a large circle and cook on medium-low heat until bubbles start to form and edges start to lift from the pan. Gently flip and cook for one more minute (turn the heat down if it cooks too fast or a crusty bottom starts to form). 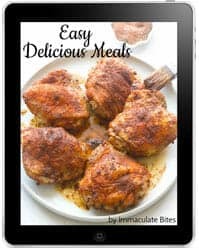 Remove from heat and serve as suggested in the recipe box. 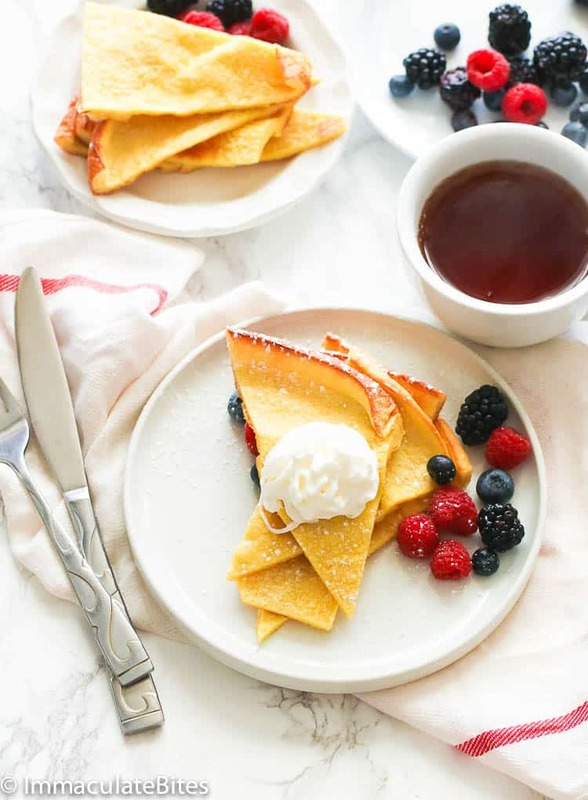 Now since Valentine’s Day is around the corner, you can put a smile on your loved ones with breakfast-in-bed meals using either one of this easy breakfast hit recipes. Serve this wonderful breakfast meal with fruits on top, powdered sugar or maple syrup. So why not start this special day with a special pancake to share for two with a hot choco or coffee. Enjoy and Happy happy Valentine’s Day! 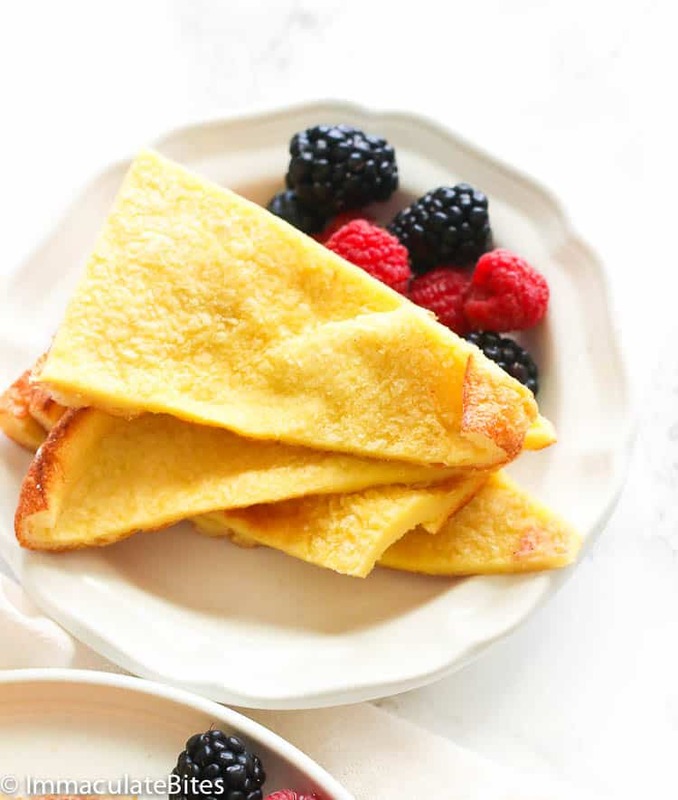 German Pancakes - baked pancakes that are lighter than your usual pancakes made primarily with eggs, milk, flour and vanilla. These pancakes are baked in a pan which makes a quick and easy pancake breakfast or breakfast-for-dinner in no time. 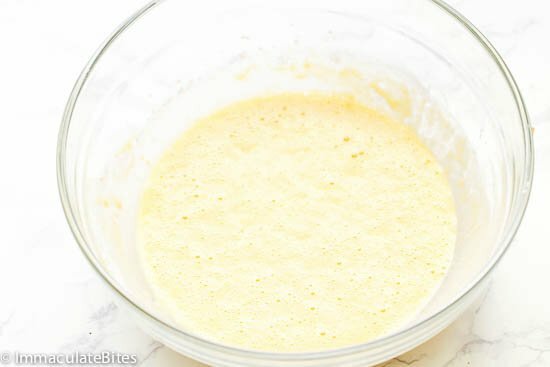 Beat the eggs and slowly pour in the milk and whisk until fully combined and smooth. 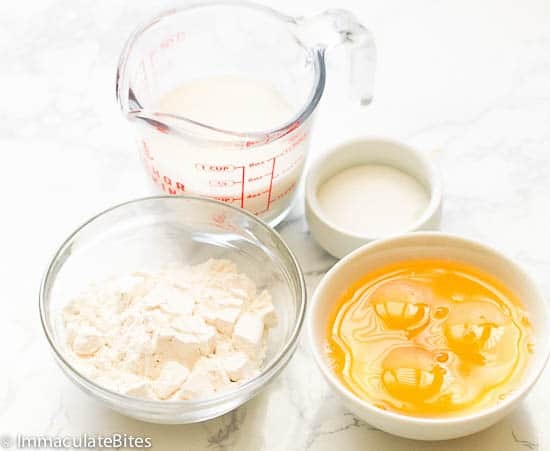 Add flour, sugar, and salt into the egg mixture and whisk until you no longer see any lumps. Then add vanilla extract and whisk. Set aside. In a skillet or pan, add butter and place the skillet in the oven for the butter to melt. 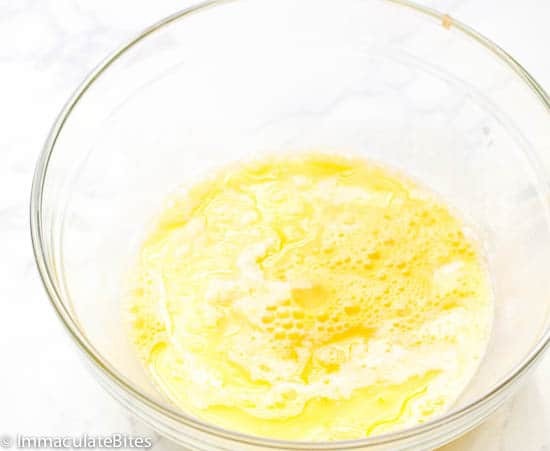 When the butter has melted, gently swirl the pan to evenly coat the surface. 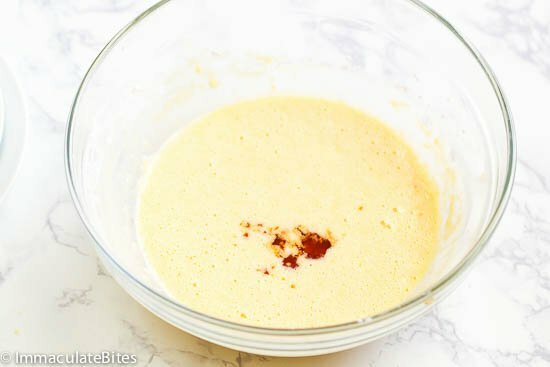 Then slowly pour the batter into the buttered skillet and bake in the oven for about 15 minutes or until the edges are golden. Remove from the oven and serve with fresh fruit on top, whipped cream or powdered sugar. 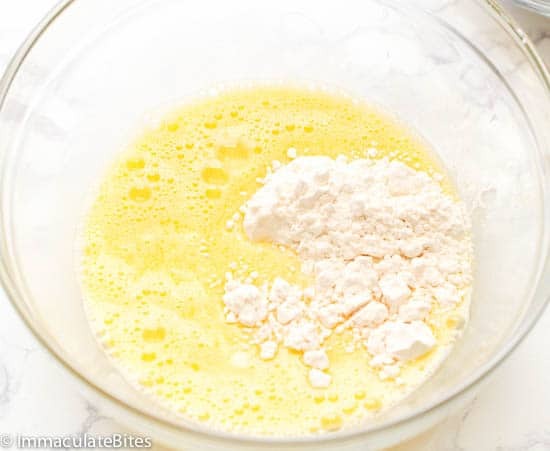 Add flour, sugar, and salt into the egg mixture. Whisk until you no longer see any lumps. Add vanilla extract and whisk. Set aside. In a skillet, add butter and place the skillet in the oven for the butter to melt. When the butter has melted, gently swirl the pan to evenly coat the surface. Then slowly pour the batter into the buttered skillet. And bake in the oven for about 15 minutes or until the edges are golden. Remove from the oven and serve with fresh fruit on top, whipped cream or powdered sugar. Hi Imma, we left Germany about 4 years ago. So I thought I should give my girls and hubby a treat. And YES, it came out perfect! Nobody spoke until half way through the meal. That’s how good it was. Thanks for keeping my kitchen alive. Hi Esther, yes you can.Thanks Girl! I’m about to start making these like every weekend. I hear you! Jennifer! I can’t seem to have enough of it. my grandma made them like you – she put always sliced apples in the dough but did not put them in the oven after baking them in the pan. They were being served with powdered sugar on top. She was from the German part of Silesia. Hello, Antonia. Thank you for dropping by. Grandmas are the best! It could be with the mixing part or type of pan used. 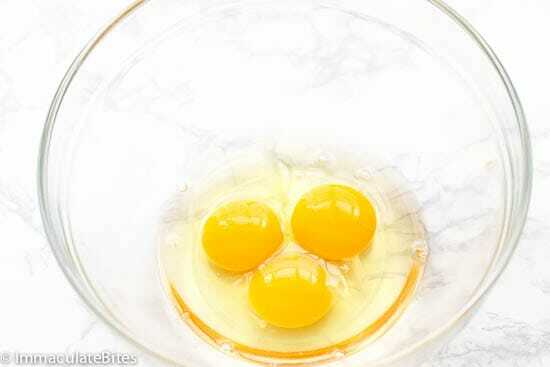 Did you beat the eggs before adding other ingredients into it? This is called ‘German’ – just like the ‘German cake’.. but we have never heard of it in Germany..
Hi, Mia. 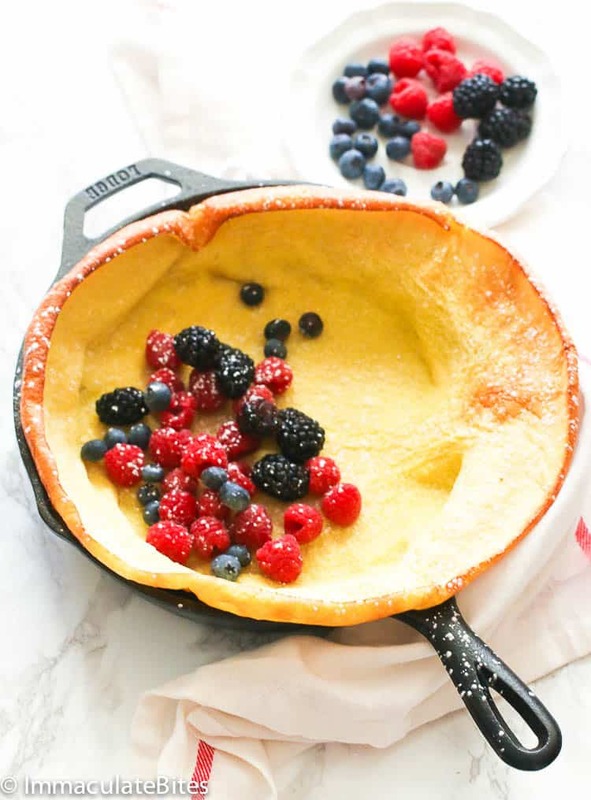 It was said to have originated in the Atlantic side of the U.S. which is also known as “Dutch baby” with the Dutch name having to do with the Pennsylvania Dutch- a group formed by German immigrants in the 17th and 18th century. And it’s more of an American popover.